To continue to offer our existing and new clients the quality service expected from shentongroup, it has become necessary to invest in another Sales Engineer for our Power Care, Power Rental and Power Call products. These areas of the business continue to show strong growth and in order to meet clients’ needs and site survey requests this addition to the team was key. “Coming with many years’ experience in the generator industry, this is a good move forward for shentongroup” says Andrew Fentiman, Sales Director. With the company continuing to expand in all areas, the Directors felt it time to invest in a new operating system for the entire company. Following an in depth review of what the market has to offer, shentongroup have decided to purchase the SAP Business 1 software package. The training and testing periods are well underway in this exciting project which will see improved customer services levels in every department. In keeping with our continued progress in the area of Quality Assurance, this new software will streamline many processes as we continue to improve our excellent customer services. 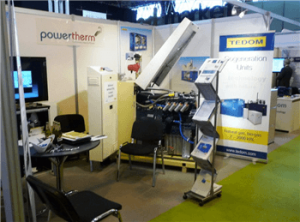 shentongroup – Tedom’s Partner for UK and Ireland – enjoyed exhibiting again this year at the 2013 ADBA show in Birmingham. Our Sales Director remarked that there is “Lots of potential in the industry for the Tedom biogas CHP units, but the marketing is still maturing”. Fully understanding the difficult needs of our clients these days, shentongroup have invested in a bespoke loadbank vehicle. Delivery of this vehicle is expected within August and will allow shentongroup to carry out load tests in more compact areas. Without requiring a trailer, the loadbank vehicle can access the generators in many more applications. This forward move further improves service coverage to our hundreds of nationwide clients. With over 240 exhibitors booked, organisers are confidently expecting to exceed last year’s visitor attendance at this ADBA Exhibition 2013. A wide and varied profile of personnel will visit the show, including senior decision makers, influential end-user clients, and key figures from industry, regulatory bodies, manufacturers, and finance providers. Following a successful showing at the 2012 Anaerobic Digestion & Biogas Exhibition, shentongroup are again exhibiting there on 3rd and 4th July 2013.
shentongroup has recently secured Contractors Health & Safety Scheme (CHAS) accreditation status adding to the list which already includes ISO 9001, ISO 14001, Achilles and Safe Contractor. This is further proof that we recognise the importance of Health & Safety in our world today. At shentongroup, we are committed to the continued safety of our clients, staff and working partners. A programme broadcast on the BBC highlighted the possibly energy issues facing Britain over the coming decades. As the service department continues to grow, so does the number of generators we are monitoring remotely across the UK. Generators can be set to run, set to close off and faults monitored from our remote monitoring service suite. We are currently investing in new IT machines and monitors as the number of contracts requiring 24/7 monitoring grows with pace. Clients are welcome to visit our HQ in Andover, Hampshire to witness this service. In order to continue to improve the company’s reputation for technical ability, quality service and rapid response shentongroup are currently in the process of employing a further Generator Service Engineer, CHP Service Engineer and CHP Project Manager to be included in the team. shentongroup Rental division have employed an additional Coordinator as the department continues to progress with speed. Having started on 26th November, the new employee has hit the ground running with the rental department benefitting from an increased rental fleet. With 500kVA generators now on the fleet, the Rental division continue to offer their clients the quality service they deserve. Would you like your generator to earn you, not cost you money? The National Grid STOR system pays you to have your standby generator on call to top up the grid when they are short of power. This does not leave you vulnerable – you have complete priority. shentongroup can efficiently carry out the necessary works to make your generator compatible with the system.